This section concerns information about Paris hotels. The city is famous for its hotels. There are hotels of all kind of categories, from the dazzling elegant luxurious hotels Palais to hotels de charme, full of atmosphere and appealing romantics, to the more simpler and cheaper family hotels at the mellow back streets. 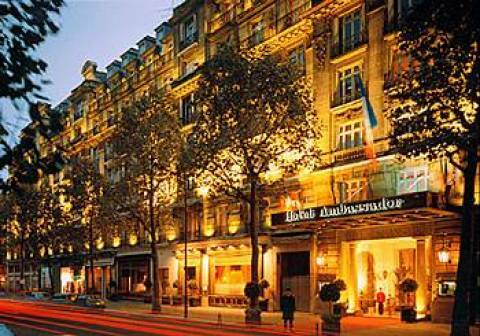 There are hundreds of hotels in Paris which can make it almost impossible to choose the right one for you. But an advice is to determine what your are planning to do when visiting Paris. Once you have done this, search for hotels in that area or in the surroundings. The most fashionable hotels in Paris is situated near Champs-Élysées as Royal Monceau, Bristol, Meurice and Plaza Athénée. Many less famous but elegant hotels are situated in the chic residentials and in the embassy-districts near Palais de Chaillot. In Marais, east of Paris, some older residents and palace have transformed into extremely attractive and small hotels with reasonable prices. The island of Ile St-Louis and Ile de la Cité in the south of Marais have many charming hotels. If you had decided to book a reservation at a specific hotel it is recommended to book at least one month ahead, because Paris is a very popular place to visit. The best way is book directly at the hotel’s website. Try to check in before 6PM at the arrival day and call the hotel if you would be delayed, to not risk to lose the room.